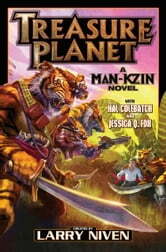 A thrilling stand-alone novel addition to the long-running, popular Man-Kzin Wars series created by New York Times multiple best seller, Larry Niven. On Wunderland, a generation after Liberation, memories of the bloody kzin conquest and Occupation have faded, and men and kzin live largely in peace. But the fabulous treasure of the kzin pirates, hidden on a distant world, remains a magnet for freebooters. Young Peter Cartwright and his kzinrett friend Marthar receive information and map from a most unlikely source and soon themselves fighting the most ruthless pirates in Known Space for an unimaginable prize. Hal Colebatch is an Australian writer, journalist, editor and lawyer with a wide range of publications. He’s best known in science fiction as a long-time series author in the Man-Kzin War universe, with many appearances in the popular anthologies helmed by Larry Niven. He has created several original characters including Dimity Carmody, Nils Rykerman and Vaemar-Riit.